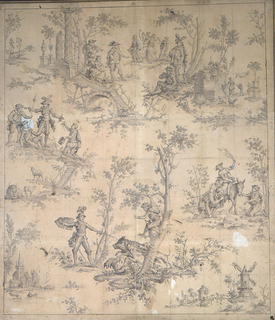 Description: vertical rectangle; four scenes from the story of "Don Quixote," by Miguel de Cervantes; Don Quixote's combat with a wild boar (lower center); Sampson Carrasco, surnamed Knight of the Mirrors, van- quished by Don Quixote, is ordered to prostrate himself before Duclina del Toboso (left); Dulcina's party (upper center); Don Quixote demon- strating his affection for Dulcina (right). Another version of this design was manufactured c. 1785, by Gorgerat of Nantes (trial proof l898-21-17B). This subject was repeated in 1813 by Hem for Oberkampf.